Fraser, V. & Garofalo, J. (2015). Novice mathematics teachers’ use of technology to enhance student engagement, questioning, generalization, and conceptual understanding. 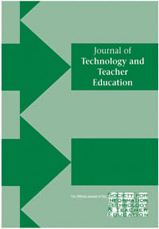 Journal of Technology and Teacher Education, 23 (1), 29-51. Waynesville, NC USA: Society for Information Technology & Teacher Education. Retrieved April 19, 2019 from https://www.learntechlib.org/primary/p/114712/.